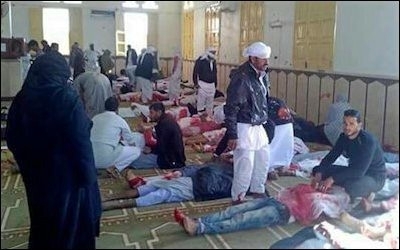 On Friday, November 24 2017, some 30 gunmen carrying the Islamic State flag bombed and stormed a Sufi mosque in Egypt's North Sinai, about 125 miles northeast of Cairo. They managed to massacre at least 305 people, 27 of whom were children. In the West, the shock of Muslim on Muslim terrorism is used to support the politically correct mantra that terror groups such as the Islamic State truly have nothing to do with Islamâ€”otherwise they would not bomb mosques and kill fellow worshippers of Allah. How can one make sense of this Muslim slaughter of Muslims? Read this analysis by Raymond Ibrahim of the Middle East Forum. Islamic State does not view its victims as Muslims. Indeed, mainstream Sunni Islam - the world's dominant strand of Islam which 90 percent of the world's Muslims, including ISIS, adhere to - views all non-Sunnis as false Muslims; at best, they are heretics who need to submit to the "true Islam." This is largely how Sunnis view Shias and vice versa - hence their perennial war. While Western talking heads tend to lump them all together as "Muslims" - thus reaching the erroneous conclusion that ISIS is un-Islamic because it kills "fellow Muslims" - each group views the other as enemies. Overall, then, when Sunni jihadis slaughter Shias - or Sufis, Druze, and Baha'i - they do so under the exact same logic as when they slaughter Christian minorities, or European, American, and Israeli citizens: all are infidels who must either embrace the true faith, be subjugated, or die. The argument that ISIS and other jihadi organizations kill fellow Muslims proves nothing. Muslims have been slaughtering Muslims on the accusation that they are "not Islamic enough" or the wrong "kinds" of Muslims from the start: So what can the open non-Muslim, such as the Western infidel, expect? Indeed, if anything, that ISIS kills other "Muslims" only further validates the supremacist and intolerant aspects of Sunnism, which is hardly limited to ISIS. Just look to our good "friend and ally," Saudi Arabia, the official religion of which is Sunni Islam, and witness the subhuman treatment Shia minorities experience.